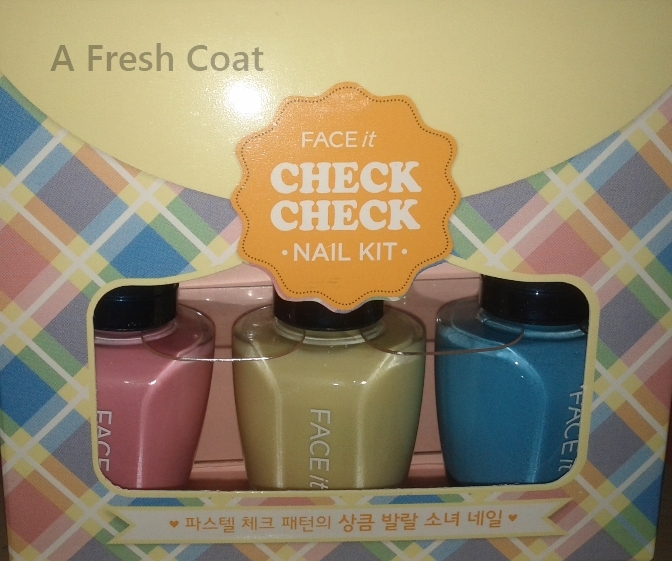 And here it is… The Face Shop’s Check Check Nail Kit #01 – Pastel Check. This is a beautiful kit! I love it more than the first one, so I’m glad I used the brights first and saved the best (pastels) for last. This one actually surprised me because I thought I would like the brights much better since I am not too big on pastels, but this is really an astonishing kit! As I mentioned back in February, I ordered these kits on eBay from Korea. 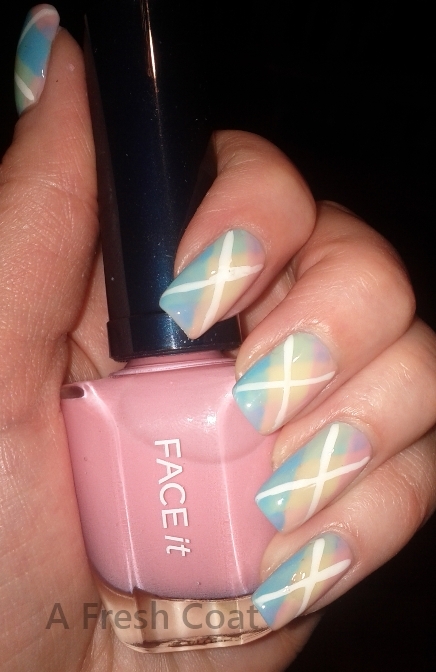 However, I wanted to wait to do these pastels for Easter and Spring. This polish was harder to apply than the brights kit (#02), since the polish was more like a watered down creme polish rather than sheer like the brights. 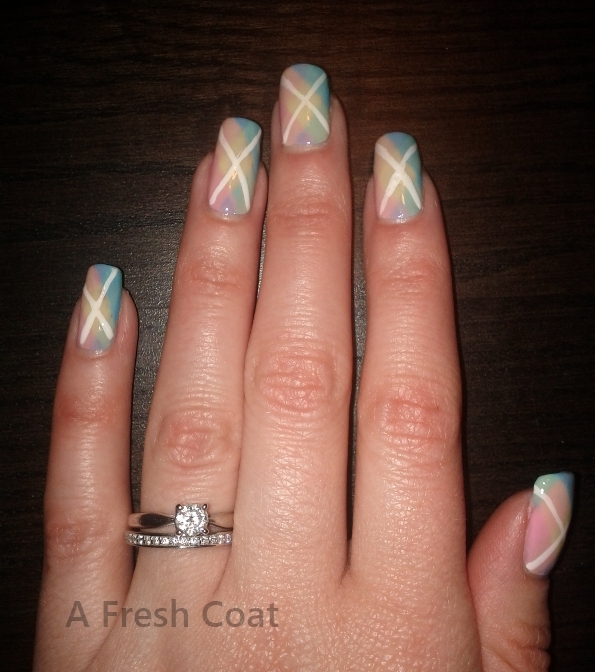 The sheer polishes from the brights were so easy to apply, but these were a bit trickier. It was still very easy to use; I just had to take more time to apply it and be more careful. 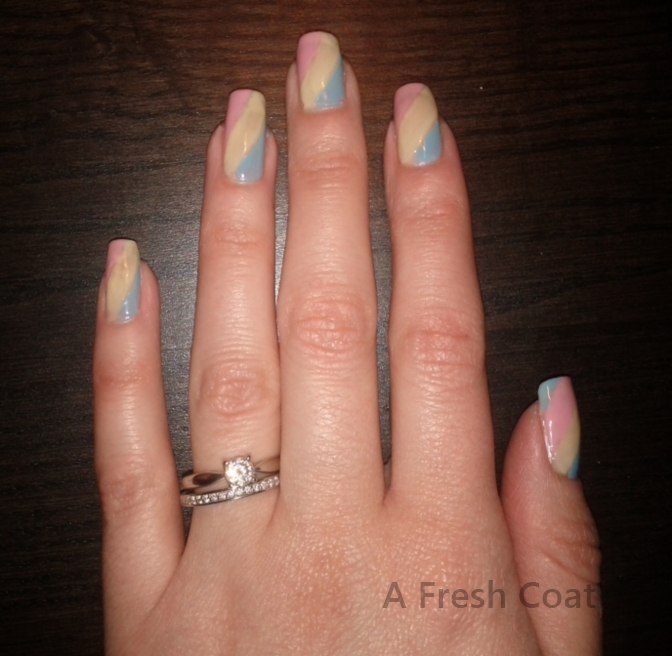 It was hard to determine the right amount of polish to put on the brush to make a nice flowing stripe. I did not use a white base this time again (as I recommended for the brights) because this polish had excellent coverage. 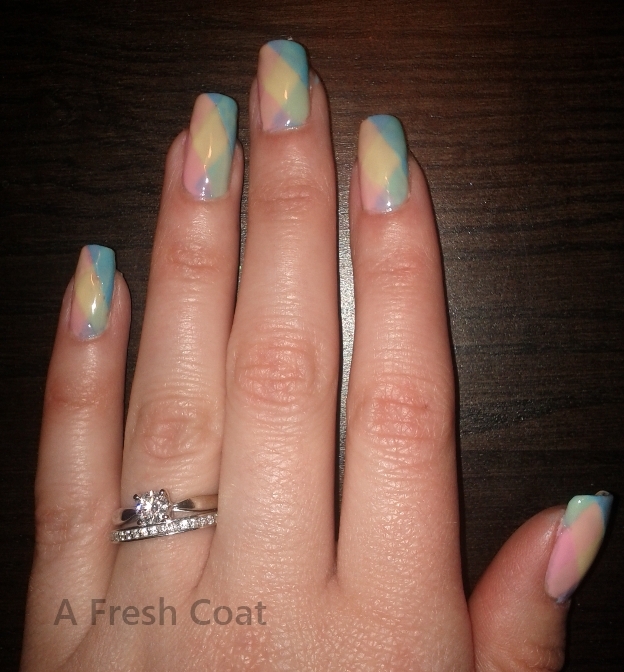 It didn’t require me to do two coats on the first step as I did with the brights. 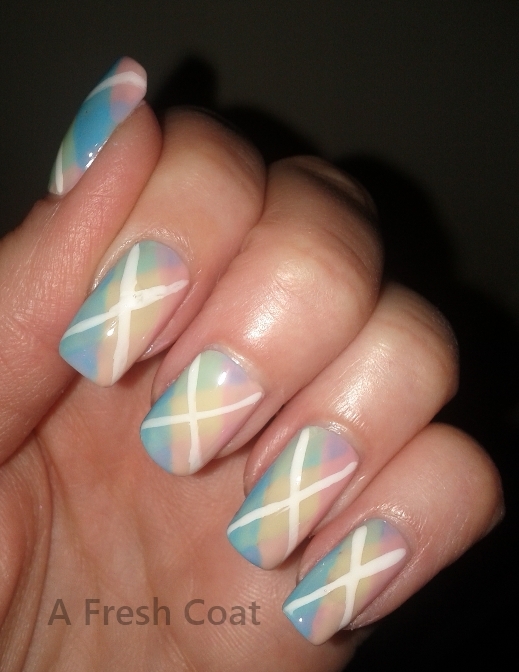 I applied the white line to my nails again to complete the look. It looks much better with the pastels since it blends in better together. 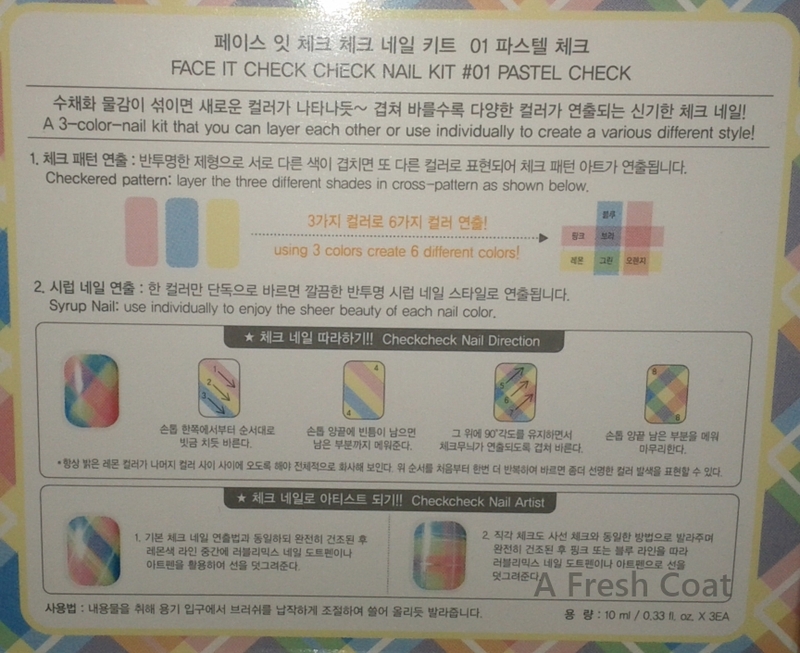 You can check out my earlier post about The Face Shop’s Check Check Nail Kit #02 here.